I hope everyone had a great holiday. Mine was nice and quiet. I’ll tell you more about the goodies I got another time as I’m still waiting for some to trickle in – kind of nice in to have some stuff to look forward to right? But I had to share one gift that one of my best friends sent me. Glue! I can’t wait to do some bookbinding and try this out. Today I went to Half Price Books to take advantage of the 20% off everything sale and I was actually a bit surprised I only walked away with three books but I got some good ones. First I found a copy of Little Boy Lost by Marghanita Laski. Yes, a Persephone book. It’s hard to find these at the regular bookstores so finding one at HPB is like a finding a treasure. The two other books are mysteries but both I believe have gotten good reviews and are historical so I think I’ll enjoy them: A Trace of Smoke by Rebecca Cantrell and The Dark Lantern by Geri Brightwell. In other news, no I didn’t write up any of my end of year posts but that’s still my goal to have those ready before ringing in 2011. How awesome to find a persephone book at Half Price Books! That is so cool. I definitely want to buy some Persephone books with my Christmas money. You know, I could have blindly looked at a picture of glue and known exactly who it belonged to! Hope you had a great holiday. I checked out there for a few days, but I think I am sorta back, despite the distractions. That GLUE looks amazing! I went to Half Price yesterday and only got a CD – I am feeling a bit overwhelmed by all the new books out there and just could not bring myself to adding another book to my TBR mountain! I thought I saw you at HPB! 😉 I only found three books as well. What’s up with that? And I must say, that is one big jar of glue! I hit up those 20% off sales too. I was looking for a different book by Laski, but sadly didn’t find it. Congrats on your new books!! Question about the Glue: Do you need to keep the paper on the jar lid? Stephanie – Oh you’ll have to share which Persephone’s you buy! My little Persephone library is at 7 books now I think. Sandy – Haha…. Glad to see you back! Hope you had a lovely holiday! Juliann – well, I was feeling overwhelmed by all the shoppers I think! ha. I can’t wait to try out the glue. Stefanie – We weren’t fighting over the same book right 😉 Believe it or not the jar is actually not that big. I just went in for a close-up! Amanda – I almost got a NYRB Classic but it was a bit damaged and as much as I love used books they do have to look nice for me to buy them. Hope you’ll find your Laski book another time! Willa – I can’t wait to go back to the other HPB store and see what they have! Well I have never read a Persephone, so my goal is to find one here..hmm! I clicked over the bookbinding supply site (I thought a friend had made the bottle of glue for you) … enjoy the books (and the vat of glue). Only a crafter could be excited about a big jar of glue–but I bet you’ll get a lot of use out of it! 🙂 I also recently bought The Dark Lantern–I read it a while ago but it was a library copy. I’d like to read the other two as well! Sounds like you had a wonderful Christmas. Wishing you all the best in the new year. 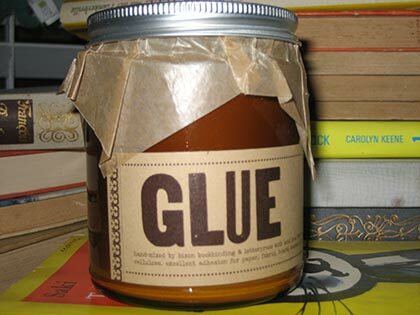 That glue is the perfect gift for you!